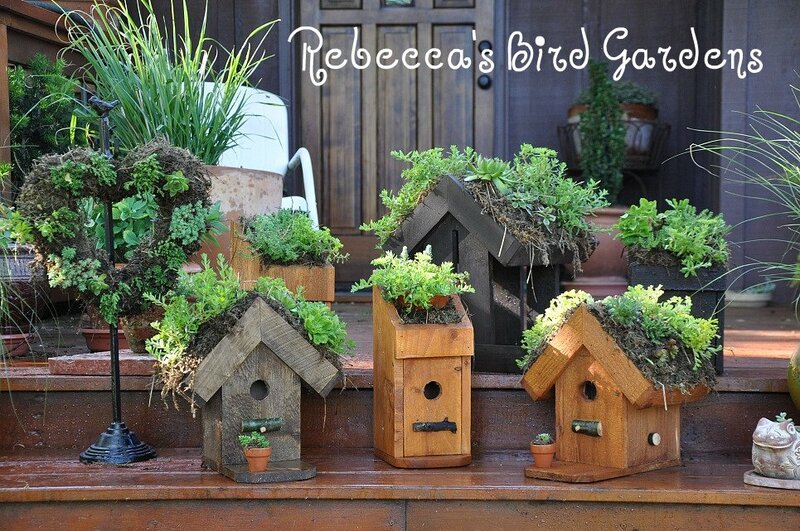 We started selling living roof birdhouses and feeders at our local Farmers' Market. All the roofs are made with drought-tolerant, winter hardy sedums and succulents. They require very little care and green, living, roofs will return each year. We're actually making a profit-that's going towards our vacation later this summer! Hey Becks they look great, what a wonderful idea. I'm in the process of making some dovecotes and bee hives too but without the green roofs. ABSOLUTELY darling! I hope you are doing well with them at the market. Congratulations on your new business! I love your idea so much I was actually looking at a bird feeder in front of my house to see if we could retrofit it. It certainly would look better with a living roof. Chris recommended your site. I love your living roof bird houses. Wishing you every success with your little business - really cool! Hi again! The cylindrical blue bird house pictured on my last post is a bird favorite. I don't think it was originally intended for blue birds but they move in every spring. This spring they were kicked out by a pair of chickadees. I had the birdhouse close to the fence to provide open space and some jerk dumped the nest, killing the eggs. I moved the house and it was empty for about a week before the blue birds moved back in. It's made out of a lightweight non-plastic material. It looks just like a river birch trunk.